Malinda Elliott Cramer had been an “incurable” invalid for some 23 years. Her spiritual experience not only changed her mind and body, it transformed her into a dynamo of energy who began a healing ministry as well as informal classes to teach these new spiritual insights to friends and acquaintances. Formal classes in “Divine Science” started in 1887. 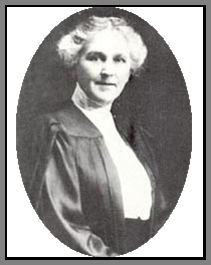 She established the Home College of Divine Science in 1888 with Primary, Theological and Normal courses she herself wrote, and taught. 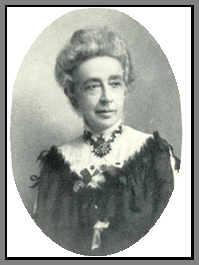 Also in 1888, Mrs. Cramer founded and became editor and writer of one of the country’s first monthly metaphysical magazines, Harmony. Starting in 1890, she taught classes in various large cities around the country, staying in some places as long as six weeks. She gave weekly sermons and set aside three to four hours daily for healing work, whether at home or on tour. She was the founder and guiding force behind the International Divine Science Assoc., the precursor of the International New Thought Alliance. Malinda Cramer died at the age of 60, a few months after being injured in the great San Francisco earthquake and fire of 1906. The doctor had given Nona Lovell Brooks the final prescription he felt might help an ulcerated throat that had made it impossible for her to eat anything but five, specially-prepared soft foods. She was slowly wasting away, down to 85 pounds, the afternoon she and her sister Alethea Small attended the fourth in a series of classes Mrs. Frank Bingham was teaching in her home. Mrs. Bingham had been very ill. The physicians in Pueblo, unable to help her, referred her to some specialists in Chicago. The doctors in Chicago were no more successful, but an acquaintance suggested she contact healer and teacher, Emma Curtis Hopkins. Three weeks of study and treatment with Mrs. Hopkins brought Mrs. Bingham back to Pueblo in radiant good health. Friends began asking her to tell them what had brought about her transformation. Informal classes began. She first invited, then insisted that Nona and Alethea attend these classes. She had heard that all the members of the Brooks/Small family were in poor health. It was during the fourth class that it happened. Nona’s whole being was “completely flooded with a great light – a light brighter than sunlight. ‘It filled me! It surrounded me! I discovered that I had been instantly and completely healed. '” Nona’s remarkable healing was only the first of the changes that took place in the family. A change in outlook, other healings, a quick improvement of their financial situation further convinced them of the truth of these spiritual principles. Nona and her sisters studied, revised, systematized and applied the teachings in their thinking and living. They centered their attention on God, His presence and action in their lives. “All creation is the expression of God · It is good from center to circumference, wholly good, like its Creator.” After moving from Pueblo to Denver, to the home of sister, Fanny James, they all attended the classes of Malinda Cramer. They found that her teachings tallied with theirs. They asked and received permission to call their work, Divine Science. Later, Nona studied at the Home College and was ordained in San Francisco. After Malinda Cramer died, Denver became headquarters for the Divine Science teachings.